We've updated our website with our new headshots ... check out! 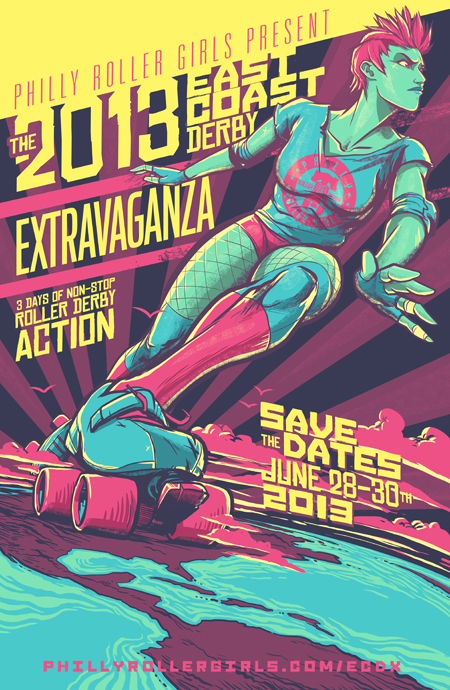 We're headed to East Coast Derby Extravaganza (ECDX), a large-scale derby event where teams from all over the country compete, at the end of the month! But we need help getting our 14+ person roster there. We've set up a donation page to help us defray the cost of travel and lodging. Transportation: carpooling skaters will travel approximately 450 miles round trip. Lodging: two nights in a hotel. We're not strangers to 6+ people to a room, but we're shooting to raise enough so everyone gets a spot on a bed! No amount is too small -- we appreciate all your support! Monday night we had practice at the Crossings in Colonie. We started with some offskates exercises lead by Bloody Knuckles Betty. This included a team building activity which Betty described as "something from the Might Ducks". After offskates we geared up for some trail skating! A couple girls didn't have outdoor wheels so they ran along with us. Viper Martini, our resident runner, was booking it! At the end she raced Trixie Firecracker down the trail and kept up! The weather held out for a very nice evening of outdoor skating. Looking forward to hitting up the Crossings again this summer! Great night for an outdoor skate session with the Hellions! Green Mountain scrimmage in Burlington. 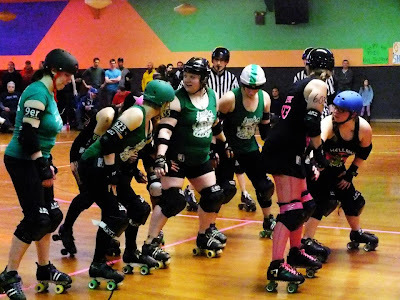 A couple weeks ago we drove up to Burlington to scrimmage the Green Mountain Derby Dames - one of my favorite roadtrips! Thank you GMDD for hosting us! After the scrimmage we headed into town for some drinks and chow. We saw a woman on the street that had a cornucopia of rainbow and unicorns. Did I mention that Burlington is my favorite? The only thing missing was a team attempt at the Vermonster again. This weekend marked my first of three consecutive derby weekends in April... The 2013 derby season is in full swing! Roc City Roller Derby hosted a St. Baldrick's event the same day as our bout. Jezibelle N. Hell decided to raise money and participate. She said she shaved her head three times in high school... so, no big deal! But it is a big deal. In the locker room after shaving. No big deal that our photoshoot was also the next weekend. Jezibelle rocked it. At least her hair was easy to "do"! Our first WFTDA sanctioned bout! 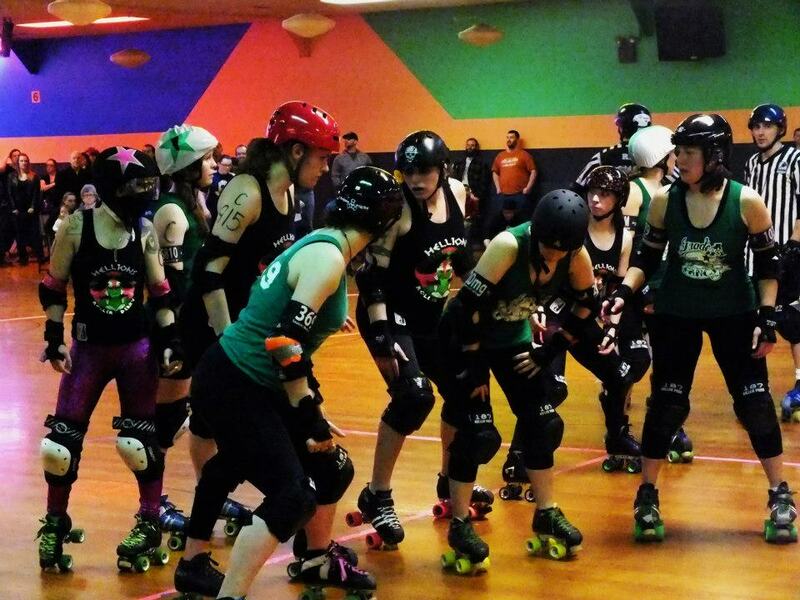 Against our great friends from Burlington, VT - the Green Mountain Derby Dames! I was on the roster for this bout, however I ended up with a late case of the flu (!!!) and ended up having to miss the bout - I couldn't even go and watch. GMDD is a strong team and was a good challenge for us. The final score of the bout of 228 GMDD - 110 HoT. This bout took place at RIT college - neat! This is also where our former skater CrickHit goes to school - so we got to hang out with her that weekend. She's skating with Roc City's B team... so awesome. I wish I started derby in college! Roc City took an early lead and racked up point quickly. The score at halftime was 211 Roc - 55 HoT. After a good peptalk in the locker room from coaching, we refocused and kept the damage minimal. Roc still took the win with a final score Roc 306 - HoT 126, but we were happy with the second half. Roc also had perhaps the best hospitality ever - their skaters set up a potluck so there was tons of different and delicious food to enjoy after the bout. 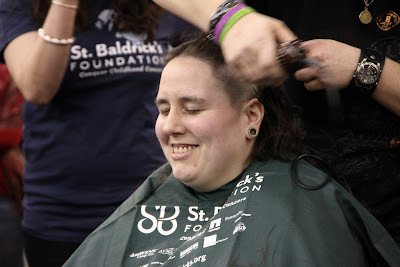 Roc City also hosted a St. Baldrick's event that day - Jezibelle N. Hell participated - blog on that coming up soon! 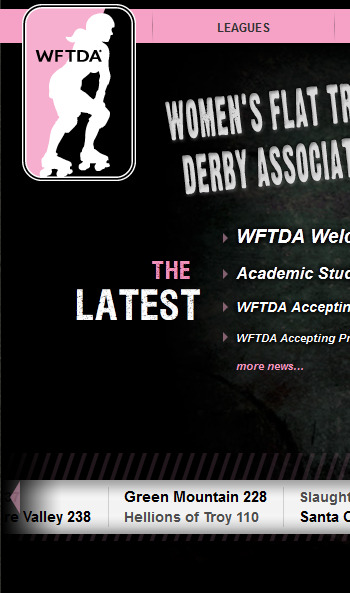 A couple weeks ago WFTDA released an updated Minimum Skills Requirements (MSR) document, a document that WFTDA member leagues had been reviewing and beta testing for the past [undisclosed amount of time]. Since the Hellions had this information in advance and our coaching department was getting ready for league evaluations anyway, we've been able to do some "dry run" evaluations this week. One of the revised skills is being able to hop over an object at least 6 inches in height without touching the object or losing balance, while skating at a moderate pace. The former standard was 3 inches. Me catching some air over the 6in obstacle. When you're brand new to derby the idea of jumping any height is intimidating. You want me to what? Are you kidding with me? Nope! I say: Just take a deep breath and go for it. Practicing jumps helps build muscle memory just in case you have to jump over a fallen skater on the track. This has happened to me before and thankfully my body just DID it without me having to think about it. Anyway, I remember when I was a new skater and would just do sort of a standard little hop, just high enough to clear the 3 inch cone. Then one day when I was feeling particularly energetic, I built up some speed before launching myself into the air, kinda trying to see if I could get my feet to touch my backside. WOW! I don't remember if I stuck the landing, but after trying it again a few more times I realized it was just another fun, new, and useful trick I had added to my skill set. The best part of this hopping drill this past week was that everyone participated, including the fresh meat. They had already practiced hops maybe once or twice in the past... maybe once jumping over an actual object. Even though there were some nervous faces, everyone gave it a shot. By the end of the drill, everyone was hopping higher than their first shot. It was awesome! Blurry Hellions (haha) clearing the 6in obstacles. Lil' Wheezy going for a big jump. NBD. Introducing our roster for tomorrow'ss bout! 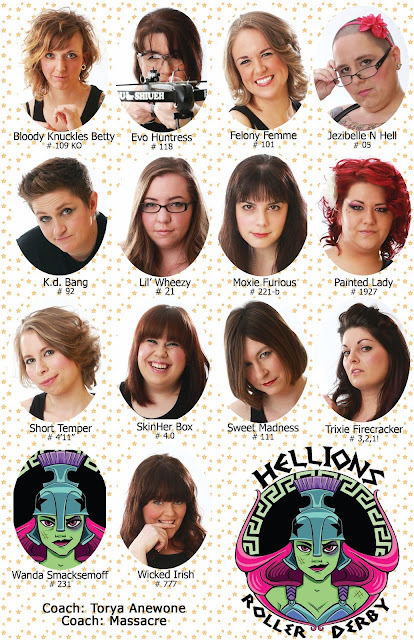 We've got some new faces making their debut with the Herculadies this weekend: Felony Femme, Moxie Furious, Painted Lady, and Wanda Smacksemoff. 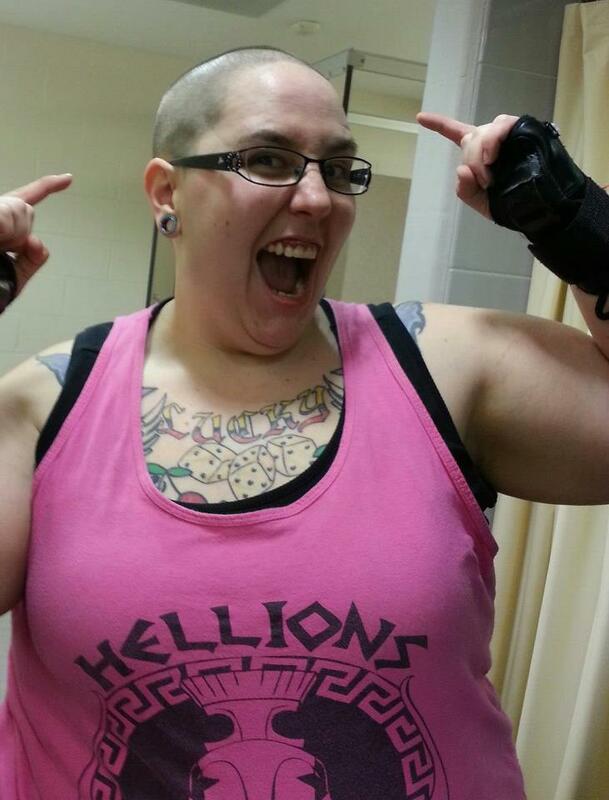 Wicked Irish also makes her Hellions home bout debut this weekend! I'm Short Temper and it's my day - April 11 ... 411! Just a quick fun post to show off my headshot from our recent photoshoot with Dino Petrocelli and True Grace Makeup! 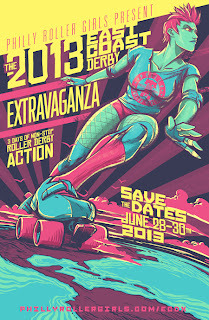 Two derby events this weekend: bout and recruitment event! 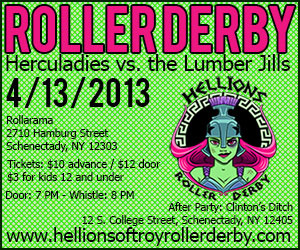 On Saturday, April 13th, the Hellions of Troy’s B-team, the Herculadies, will take on Plattsburgh’s North Country Lumber Jills. Last year the Herculadies faced off against the Lumber Jills in their closest bout of the season, skating away with the win 152 to 126. The Herculadies finished their last season with a 5-1 record and are looking forward to another successful season. 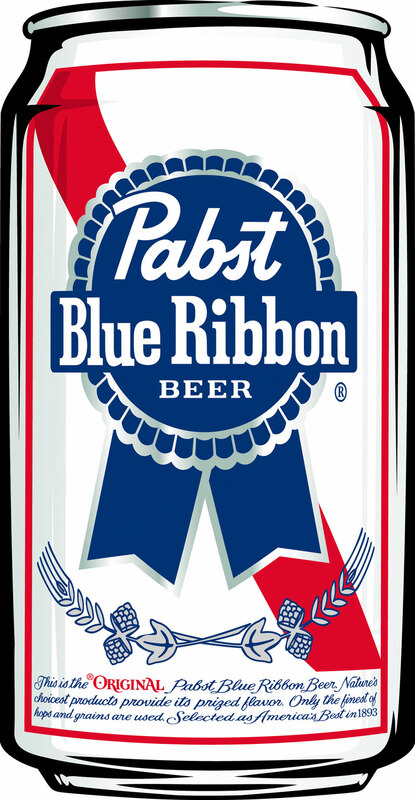 In addition to aggressive, fast-paced all-female roller derby action, fans can look forward to a beer garden at this bout! You read correctly – 21+ fans can now enjoy an ice cold beverage while watching the Herculadies and Lumber Jills go head to head on the track. 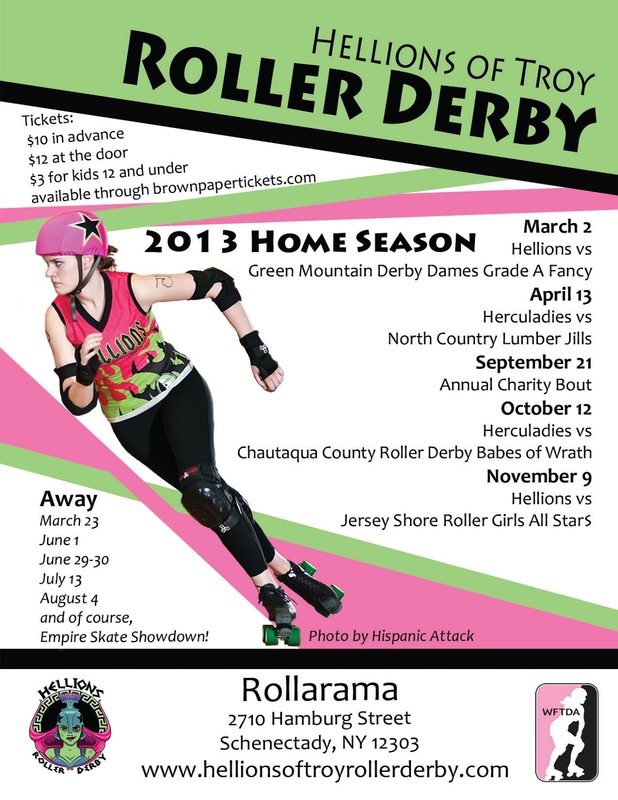 The bout will take place at Rollarama Skating Center in Schenectedy, NY on Saturday, April 13th. Doors will open at 7 p.m.; with the first whistle starting the bout at 8 p.m. Attendees are encouraged to bring their own chairs as seating is limited. An after party at Clinton’s Ditch, located 112 South College Street in Schenectedy, will immediately follow the bout. Tickets for the bout are $10 in advance, $12 at the door, and $3 for kids under 12. The Hellions also offer reduced rates for groups over 10. Open Recruitment!!! You could play roller derby! Recruitment Event this Sunday night @ 7pm at Rollarama Skating Center. The Hellions are currently in open recruitment for skaters, referees, and non-skating officials and will be hosting a special recruitment event on Sunday, April 14th from 7-9 p.m. at Rollarama to complete this derby-filled weekend. 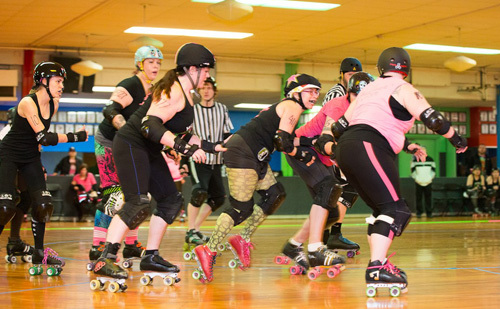 Women over 18 can join as skaters. Both men and women over 18 can join as referees, officials, and volunteers. If you have an awesome attitude, the Hellions have a place for you! To learn more about Hellions recruitment, contact hellionsrecruitment@gmail.com. + Present LivingSocial voucher at the door to redeem. You can print the voucher yourself or present a smartphone with the LivingSocial app. We will have a list of people who purchased the voucher at the door. + Living Socials are good for any one home bout: April 13, October 12, or November 9. 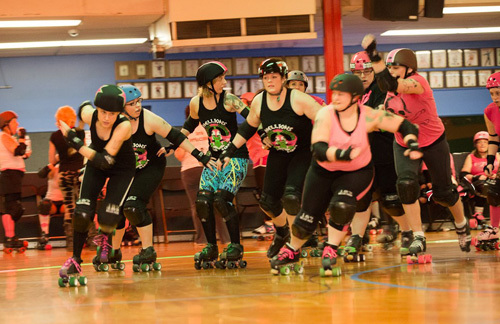 Admission to the September 21 Annual Charity Home bout is FREE for all spectators. If you purchased multiple vouchers, you will be able to use one each per bout. + Doors open at 7pm. First whistle at 8pm. Bouts are about 1.5 hours long. + Bouts have not historically sold out, but come early to get a good seat. We offer trackside seating (first come, first serve) and standing room. Fans can also bring their own chairs to guarantee seating. + If you purchased a Merch credit with your voucher, that credit is only good for Hellions merch (not Rollarama snack bar). 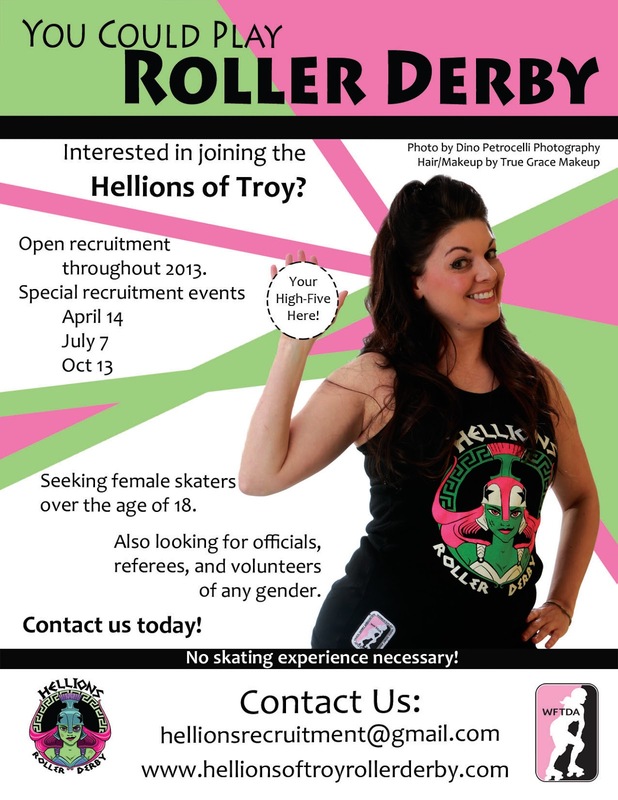 Thank you to all who purchased a Hellions of Troy Roller Derby ticket voucher is March 2013! 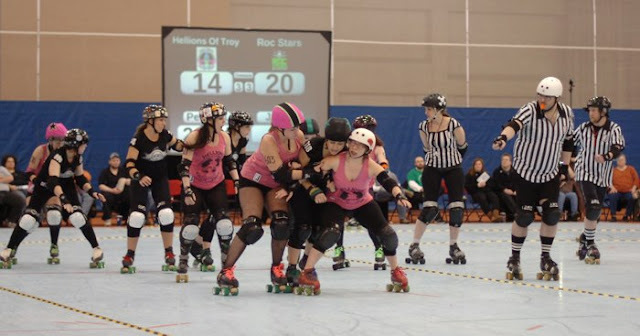 Can't make it to the Hellions bout in Rochester this weekend? It's ok - I forgive you, I guess... but you can make it up by checking out the Capital District Men's Roller Derby (aka Capital District Trauma Authority (CDTA)) bout this weekend at the Washington Avenue Armory. This bout is a double header with the Albany All Stars, who are taking on the women's team from Connecticut. 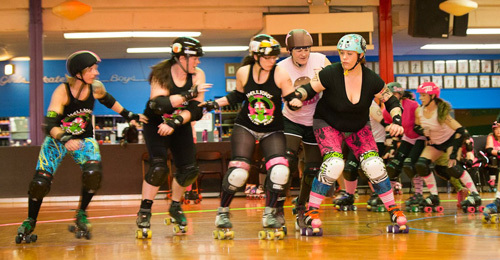 While the Hellions are taking on Roc City in a WFTDA sanctioned bout, CDTA will take on Connecticut’s Death Quads for some MRDA action! The last time CDTA went head to head the Death Quads (ranked 13 in MRDA as of Feb 2013), the Death Quads come out victorious over the Trauma Authority (ranked 15 in MRDA as of Feb 2013). CDTA is looking for a home win this time around. The bout will take place at Washington Ave Armory in Albany this Saturday March 23rd. Doors open at 5 p.m., with the first whistle starting the bout at 6 p.m. Tickets are $10 in advance, $12 at the door, and $4 for kids under 12. 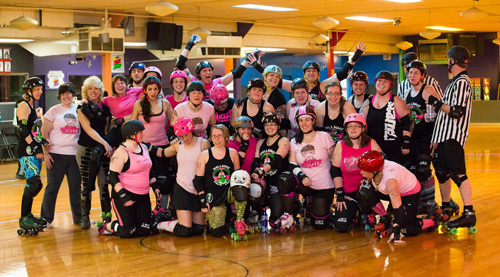 This weekend we are headed out to Rochester to take on Roc City Roller Derby. 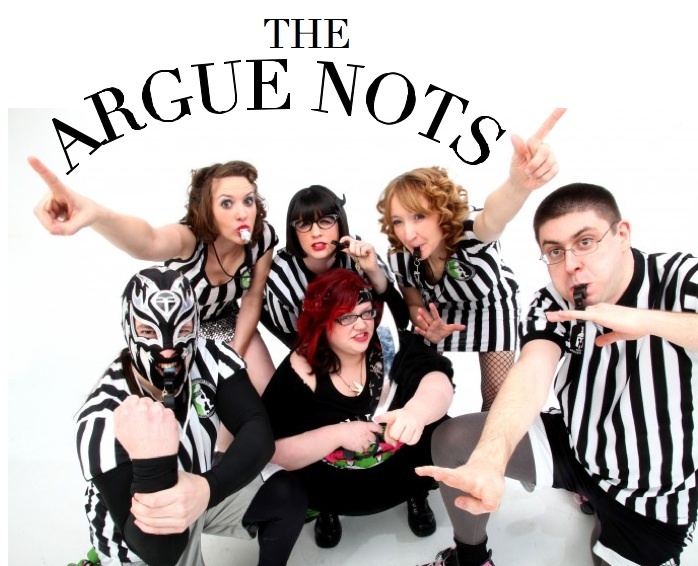 It's a double header bout, more roller derby than you can shake a stick at! I totally love their bout art work! 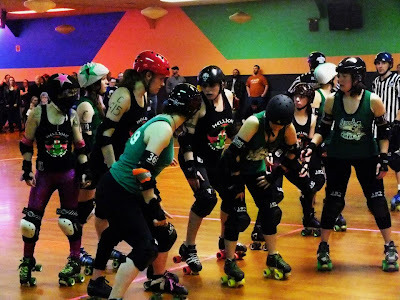 Our last full length bout against Roc City was in 2011 against their B-Team , a close game! Hellions 85 - Roc City 92. This time we're sending the Hellions for a sanction bout, which will count towards our WFTDA ranking. I actually missed that game that year (I think I was on vacation?). The last time I was in Rochester was for roller derby was for a newbie scrimmage with the Utica Roller Girls in 2010! I think it was one of my first away scrimmages. I specifically remember being afraid of one of their really tall skaters, GWAR (who still plays, I see). I described her as "7 feet tall" in my blog post about the scrimmage, hahaha. We will see if that is actually the case. That weekend I drove out to Rochester with Kitty P and Reading Rambo and we stayed at Kitty's house. The next day we went to the Lilac Festival. It's one of my most fond roller derby field trip memories. On Friday night I took a little roadtrip to Oneonta with Jezibelle N Hell and her kiddo Lilly (aka my sidekick) to check out the Mid-Hudson Misfits first game ever! 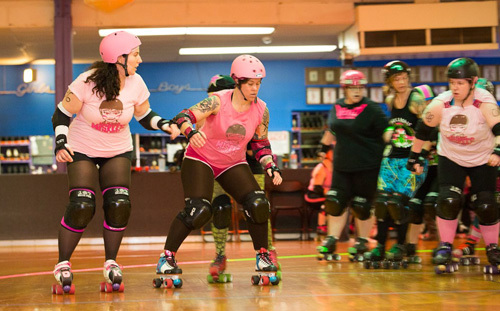 They were hosted by the Oneonta Roller Derby's Derailing Darlings. I've been out to their venue (Interskate 88) a couple other times for their bouts, including their first one against Central New York (CNY). I really love all the strings of lights they hang from the ceiling at the venue! The bout was fun - not a very fast level of play, but I still saw team work and basic strategy. Oneonta was pretty aggressive with their hits and their jammers liked to go one-on-one with the other jammer. The Misfits were down by about 70 points at halftime, but they started the second half strong. Oneonta wasn't ready to give up their big lead, though. I recall Squirrel Jam having a crazy awesome power jam - it was awesome!! There were definitely a couple confusing points with too many people in the box. The Misfits came to our practice a couple weeks ago to scrimmage, so there were lots of faces I recognized on the track. I have known Square Broot (I love her name!!) and Ophelia Knockers since I started playing roller derby! I was really happy to see them play! I also saw Miranda Wrights back on skates (yay!) and hung out with Pushup Zebra and Hispanic Attack. The only bummer was the ride home -- snowstorm!! Some people say Jezibelle is a crazy driver...but she definitely knows how to drive in the snow. But then once the snow was clear - I'll admit... she's pretty crazy. Overall, great roadtrip down I-88! And lastly... enough of my crappy iphone photos... make sure to check out Hispanic Attack's photos on facebook! Roller Derby Living Social Deal! Mark your calendars! A month from now we'll be back at Rollarama Skating Center for an action packed Saturday night! Our B Team, the Herculadies, take on our friends from Plattsburgh - the North Country Lumber Jills! The Herculadies came out on top the last time our teams met in a full length bout, last year on June 16 (Herculadies 157 - Lumber Jills 12). The teams are well matched and the Jills are a super super fun team to play (and even more fun at the afterparty!!!) Hope to see you April 13! Going to our bout? Say so on Facebook! Hellions and Green Mountain lined up to start a jam. Baby Nuclear lined up as the Hellions jammer, sporting a hockey helmet and bandana - intimidating! While we didn't win the bout, it was still a good time and a learning experience for the Hellions. We had a packed house -- a great start to our season! Thank you to everyone for coming out. 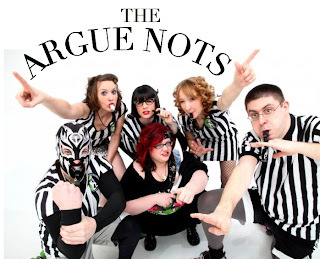 Lastly, one special thing about this bout: it was our first WFTDA sanctioned bout! When we play other charter teams from WFTDA leagues we are able to be ranked amongst the other WFTDA leagues in the world. I think we need to play one more ranked bout before we are eligible for rankings. Anyway, even though we lost, it was really awesome to see our name on the WFTDA website after the bout. Final score: Green Mountain 228 - HoTRD 110. First home bout of 2013 this weekend -- Saturday March 2! 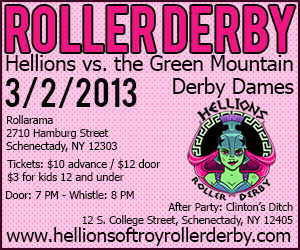 On Saturday, March 2nd, the Hellions of Troy will start their 2013 season off with a bang against Vermont’s Green Mountain Derby Dames’ Grade A Fancies. The Hellions of Troy became a Full Member League of the Women’s Flat Track Derby Association (WFTDA) in December of last year and are looking forward to their first season as a ranked league. The bout will take place at Rollarama Skating Center in Schenectedy, NY on Saturday, March 2nd. Doors will open at 7 p.m., with the first whistle starting the bout at 8 p.m. Attendees are encouraged to bring their own chairs as seating is limited. 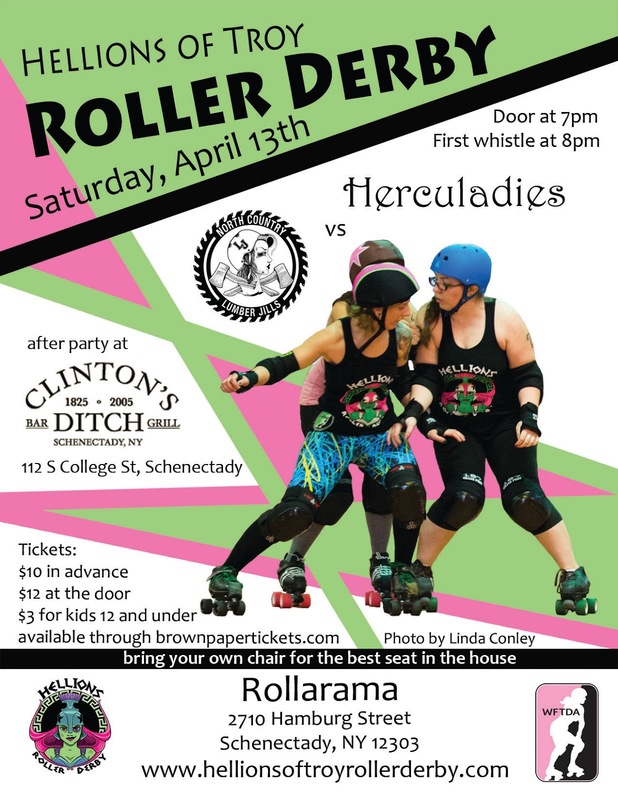 An after party at Clinton’s Ditch, located 112 South College Street in Schenectedy, will immediately follow the bout. Tickets for the bout are $10 in advance, $12 at the door, and $3 for kids under 12. The Hellions also offer reduced rates for groups over 10 and a $35 season pass (a $48 value) for those interested in attending all four home bouts this season. You can also buy tickets direct from any Hellion. On Sunday night the Hellions hosted the Mid-Hudson Misfits, a team from Ulster County, NY. 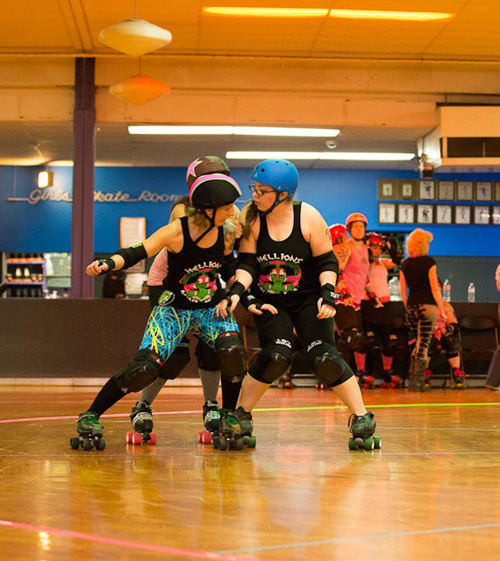 We had two new skaters playing who had never bouted: Painted Lady and Felony Femme! MHM had several newer skaters as well. 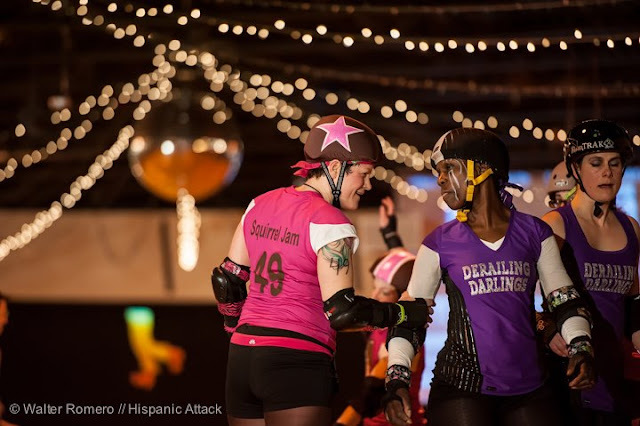 Felony Femme, black jammer, breaks through the pack. 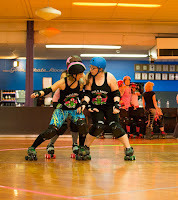 and Trixie Firecracker to hold back the MHM jammer. The teams and officials started showing up around 6:30 and as always it was a group effort to tape down the track. Anya Tailgate's boyfriend recently made an awesome contraption that easily lays down rope and tape all in one go! We had several visiting officials for the scrimmage as well, including LudaChris Speed and a referee named "Goodeye Might". Please say his name outloud and laugh when it gives you an Australian accent. I love it! Some skaters also invited some friends and family, so we had a tiny crowd to catch the action. One of our superfans, Special Ed, even made MHM some welcome signs! hold back the MHM jammer. For this scrimmage I jammed (instead of blocking) almsot exclusively. We used about a 3 or 4 person jammer rotation. Honestly, I wish I had warmed up a little better for the scrimmage. I did some easy laps and stetched, but not what I typically do before an actual bout. Reminder newsflash to me: a scrimmage is treated pretty much just like an actual bout! Even though I felt a little lethargic, I think I jammed pretty well - very much in part due to the excellent blockers on my team. Wicked Irish giving me a little push to help me break past the last two pink blockers. Even though MHM is newer, they still had some good concepts of strategy and a couple good jammers. They were also very, very nice! I love when derby girls are friendly or chatty on the line. I have a lot more fun. I have known Square Brute and Opehlia Knockers of MHM for almost my whole derby career- they are so nice! 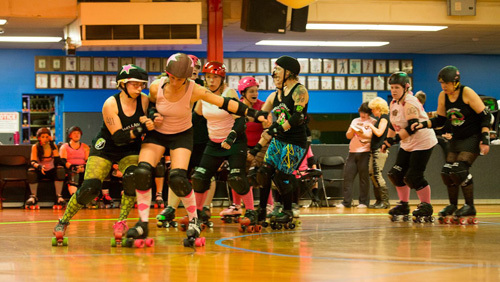 Ophelia Knockers and Square Brute (in pink, left) work together to hold me as jammer back. The Hellions won the scrimmage but I think we all had fun and it was a good learning experience. Excitingly, the Mid-Hudson Misftis just announced their season schedule! Their first bout is Friday March 15 against Oneonta Roller Derby.